← Polyform: They Heard Us! A few years ago, just about this time of year, I spent a month living outside of Santa Fe, NM, with other polymer artists. During that month the vegetation turned from autumn reds and golds to brown and straw. As the vegetation became less colorful the varied colors of the rocks in the arroyos (dried river beds) became increasingly apparent. 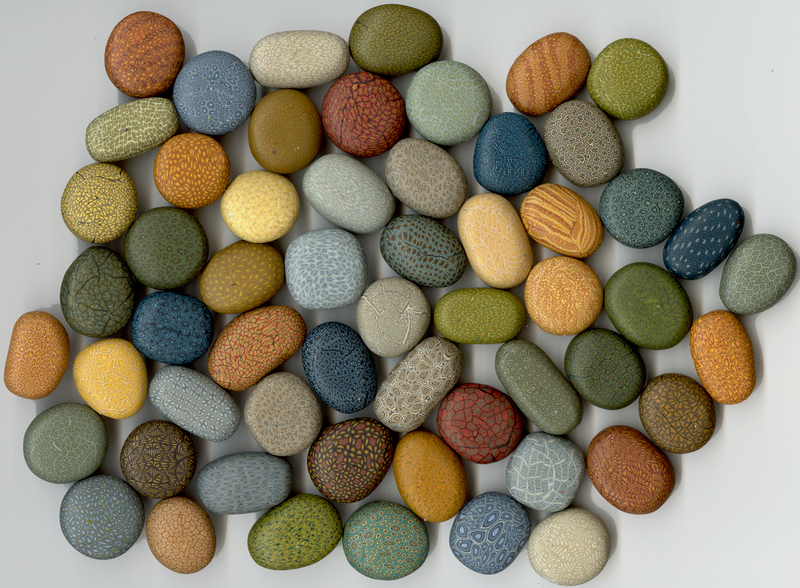 I was inspired to make these polymer “river rock” beads using caning for the different surface textures and colors I saw on my walks. It seems to me that polymer artists have barely scratched the surface of the abundant possibilities for using canes to create visual texture rather than designs or imagery. Two standouts in this respect are master artists Cynthia Toops and Ford and Forlano. This entry was posted in Caning, Color, Sources of Inspiration and tagged caned rocks, Carol Simmons, Color, Color Mixing, Kaleidoscope Canes, polymer beads, polymer clay, Polymer Clay Classes, Polymer Clay Colorado, Polymer Clay Teachers, Polymer Clay Techniques, Polymer Clay Workshops, texture. Bookmark the permalink. These are great looking! What a fun way to create the look of texture on smooth surfaces. Beautiful colors! You are so right about the lack of use for canes for visual texture. I haven’t try that. Something for my to do list. Thanks for sharing. Beautiful! Thank you for the inspiration :]. 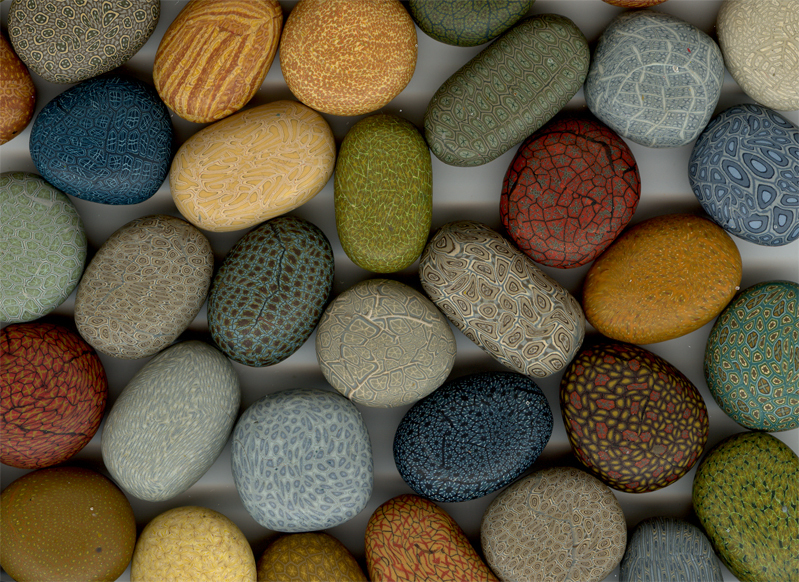 I love the textures as well as the lovely colors. Nature is wonderful and you have recreated some gorgeous replicas of it. I am wondering what you will do with them? I can picture them beaded on a chain, , but what else. I have enough jewelry now to last a lifetime and I do love these “rocks” and want to use my own renditions for something, but I am at a loss. How can that be????!!!! :-O Got any ideas? Thanks for sharing! Thank you Linda. I was going to make a necklace but I love looking at them all spread out together. They are in a display case. Hi Carol, your designs are beautiful; they remind me of fossilized coral, and the dark steely blue ones are very alluring, many thanks for the lovely picture! Thank you. I’m hoping to get back to that type of work soon.